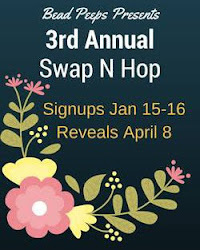 It`s time again for yet another Swap N Hop from Bead Peeps, and my third time participation . I can`t even begin to tell you how excited I was for this. 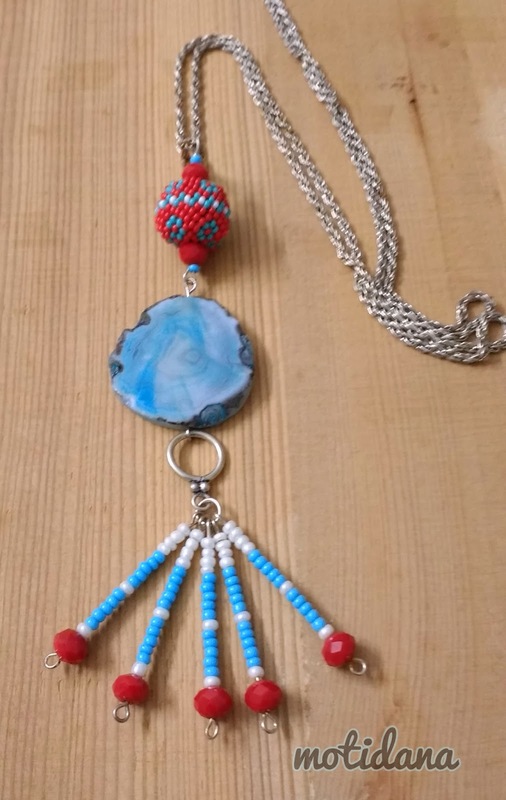 The next necklace I made uses Howlite drops with royal blue seed beads from my stash. 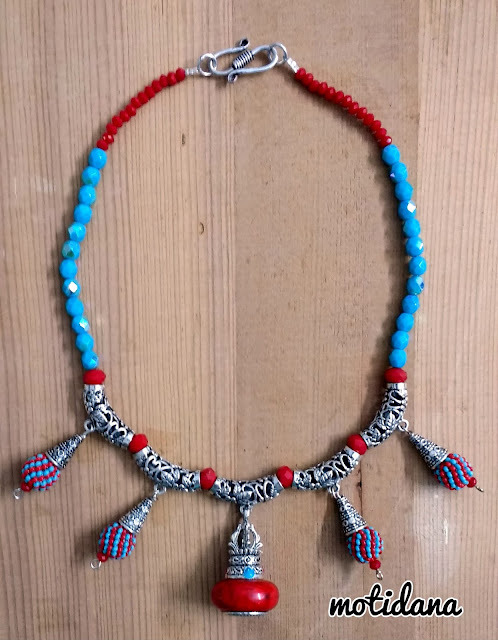 The cotton yarn closure adds a tribal look to this beautiful necklace.I love this necklace as it matches with a lot of sari`s I have. Another necklace I have created uses gorgeous Superduo`s sent by Rebecca. I had this brass wire component for a few years in my stash, and the shade matches so well with the pendant I have made. Another favourite of mine is this lovely blue and red necklace, using faceted blue beads sent by Rebecca . German silver links with beaded bead drops compliment the focal Tibetan bead pendant. And lastly made this bead embellished bangle. 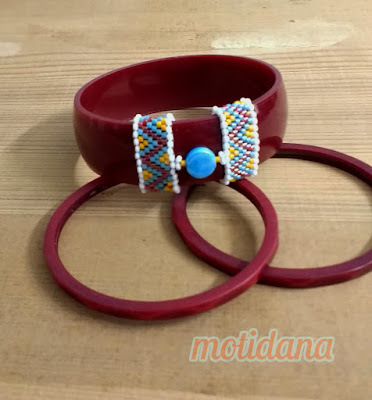 Red and blue seed beads interwoven uaing peyote stitch create a decorative look on a simple acrylic bangle. It has been a fun filled time and a lot of learning along the way, and I thank Rebecca for sending me such a lovely stash. 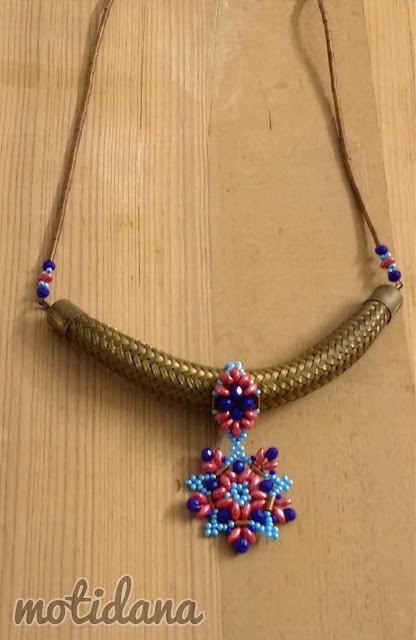 Hi Palak, your beaded bead and fringe accent the focal well in your first necklace. The drops collar is spectacular. I agree that the woven brass component shows your stitched focal perfectly. The blue and red necklace is a great statement piece. The peyote stitched strips make that bangle pop. 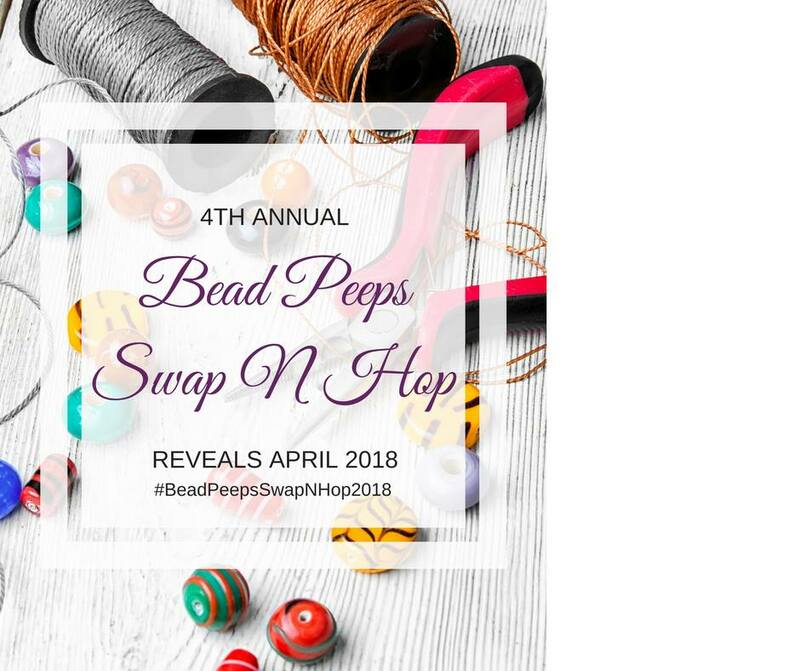 You did an outstanding job using your swap beads. I really like the netted bead necklace, it has a very ancient egyptian look to it. Your pieces are all unique and unusual. Good job! Oh wow. You got so much accomplished with this challenge! They are all fab designs,but that second one made me gasp. It's really gorgeous. I love the brightness of the colors, and netted work aways captures my attention. You did an awesome job!! All your pieces are beautiful. Your seed bead accents add just the right touch. 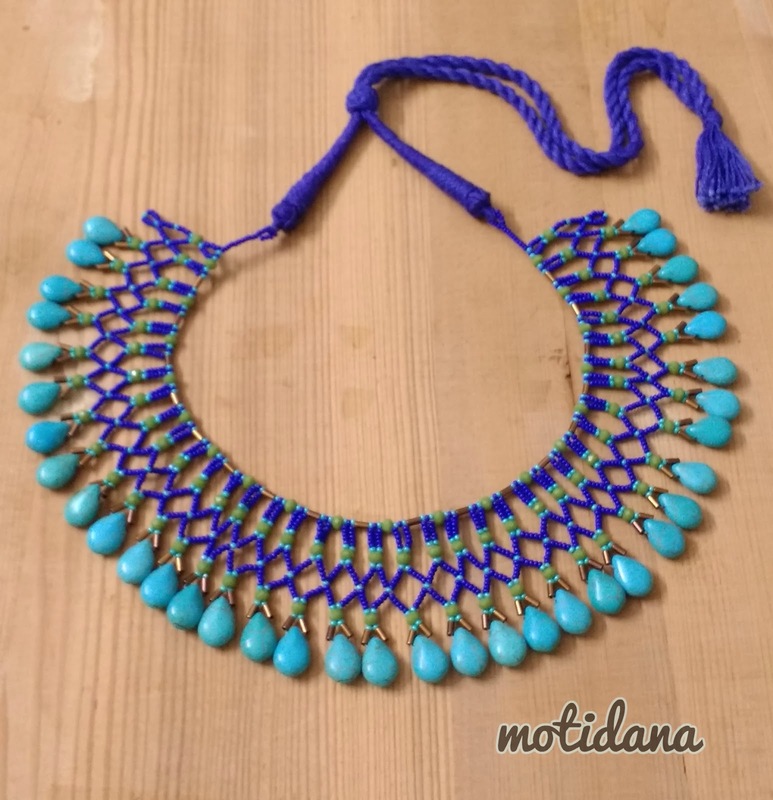 The royal blue necklace with Howlite is a real stunner. Bravo! Wow! You have made some amazing desigs. Your beading leaves me breathless. I think the netted piece is my favourite. So delicate and yet vibrant. Beautiful work. Especially the howlite collar! I love that collar! Such gorgeous pieces. That collar in Cobalt is luscious! It literally took my breath away. Great work! Beautiful pieces! 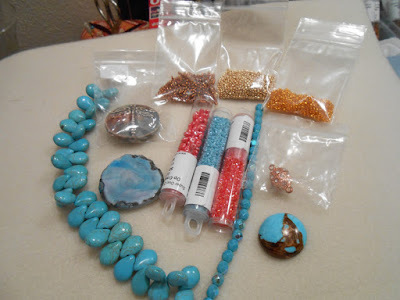 I will start with the bangle because the embellishment is so clever - I am a newbie in seed beading and still discovering how versatile it can be! Your jewelry looks modern and traditional at the same time and would be a good choice both in formal occasions and casual wear. I love the tribal looking necklace! It makes me want to travel! Beautiful necklace design. Thanks for sharing.